Crisis situations that require quick reaction and on-the-spot decision making are often unexpected and unavoidable. The degree of our success in responding, controlling and managing such a crisis is directly reflected by the level of effective and relevant training of the people involved. Having accurate continuity plans are not enough to ensure a successful recovery. People must be trained. Conducting disaster exercises is one of the most important activities that we can do to train people to respond, restore, and recover from a crisis event. These exercises transposes our response and recovery strategies from theory based ideas to sure to work reality. 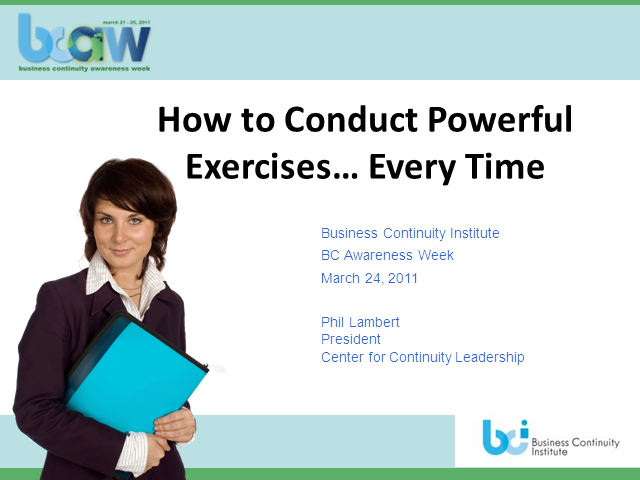 Exercises build continuity muscle by producing accurate and viable documentation and knowledgeable and trained people when designed, developed and conducted correctly … but what does it take to pull off a powerful and effective exercise? How do you measure the results of an exercise? And how can you leverage the learning environment that the exercise creates for maximum learning experience?